Major ratings agencies have assigned a negative outlook to Illinois. To move forward, the state can’t pass just any budget – especially one that’s $7 billion out-of-whack – to get beyond its crisis. With today’s fiscal stress, a bad budget is worse than no budget. A budget without reforms will only allow Illinois’ debt to continue to spiral, putting investors – and more importantly, Illinois residents – at risk. Moody’s Investors Service downgraded Illinois credit rating again June 8 and S&P Global Ratings followed suit on June 9, reflecting the continuing collapse in the state’s finances. Moody’s has the state’s debt rated at Baa2, just two notches above junk bond status, while S&P’s rating is now BBB+, just three above junk. Both firms, along with Fitch Ratings, have assigned a negative outlook to their ratings, signaling that other downgrades are likely. The knee-jerk reaction to the downgrades is to blame the lack of a budget as the only reason for Moody’s and S&P’s negative stance. After all, the state has not had a budget for more than a year, and there appears to be little chance the state will pass a budget for the next fiscal year any time soon. But a glance at the recent history of Illinois’ credit downgrades reveals that the lack of a budget is not the underlying issue for Illinois’ deep slide. Illinois’ problems did not start with this fiscal year’s budget gridlock. Instead, the real blame lies with the state’s chronic history of bad budgets, prioritized spending on state workers, and the refusal to pass spending and pension reforms. That’s why Illinois suffered 13 credit downgrades under Gov. Pat Quinn, despite the existence of budgets, “compromises” and the more than $31 billion in additional tax hike revenues from 2011 through 2014 as a result of the record tax hike in 2011. Those downgrades are reflective of the fact that the state continues to play games with taxpayers by passing budgets that are never balanced. 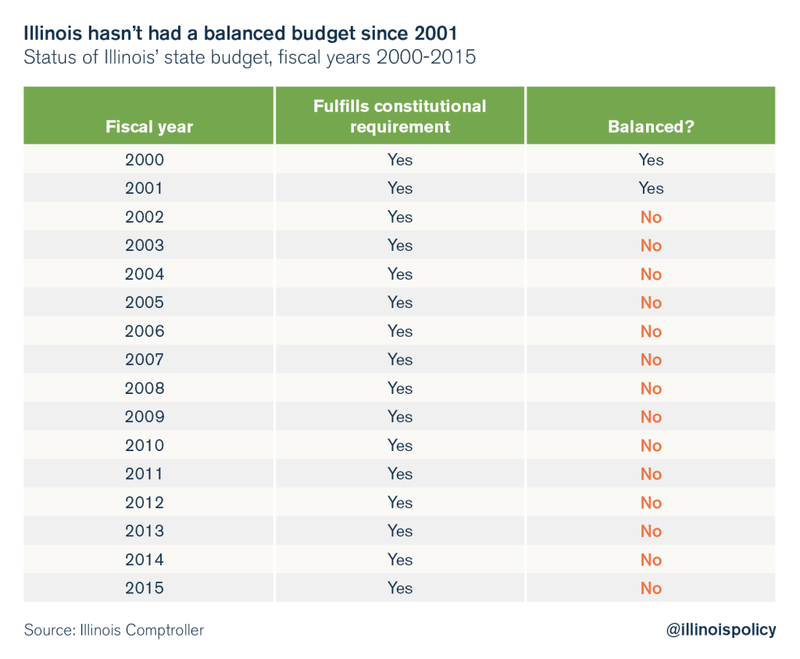 According to the Illinois Comptroller, Illinois has not had a truly balanced budget since 2001. Proponents of more tax hikes will use the credit downgrades as proof that Illinois needs more revenues. But even an extra $31 billion in revenue from the 2011-2014 income-tax hike under Quinn didn’t slow down the onslaught of credit downgrades. 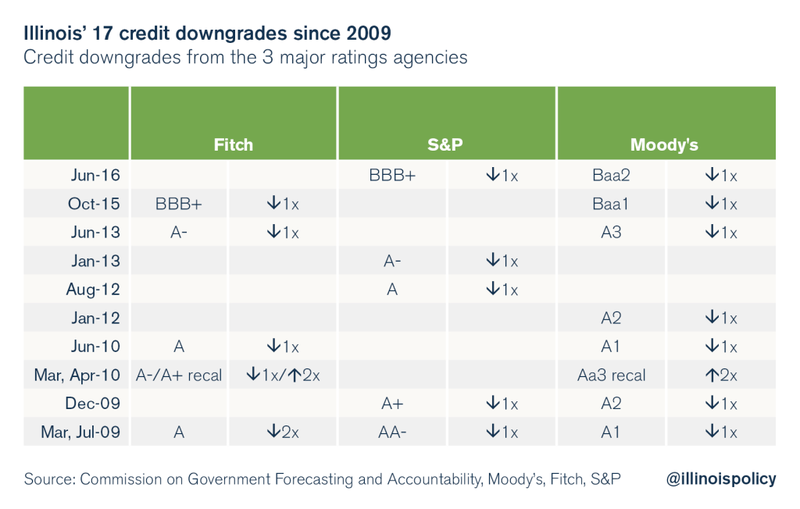 Ratings agencies downgraded Illinois five times during that period. That’s because politicians continued to prioritize spending on state workers – whose unions fund their election campaigns – at the expense of core government programs and responsible spending habits. The proof is in how politicians acted after passing the 2011 income-tax hike. Rather than enacting much-needed reforms, lawmakers spent 90 percent – or more than $28 billion – of the hike’s additional revenues on state-worker pensions, crowding out funding for nearly everything else. Both K-12 and higher education funding were cut by nearly 10 percent in that four-year period. More money in the hands of politicians only removed the pressure to enact spending and pension reforms. 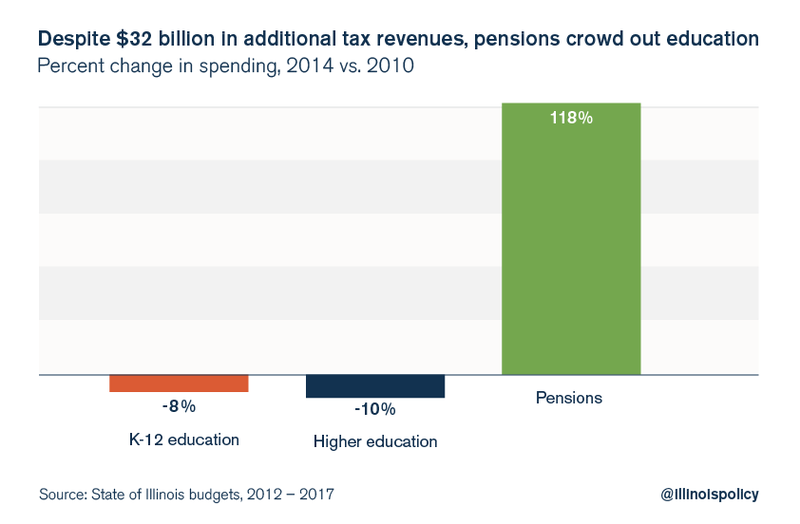 Lawmakers proved that if they can get their hands on more tax dollars, they’ll keep funneling money to where it’s most politically expedient – state-worker pay and benefits – rather than actually fix Illinois’ fiscal problems. To move forward, Illinois can’t pass just any budget – especially one that’s $7 billion out-of-whack – to get beyond its crisis. With today’s fiscal stress, a bad budget is worse than no budget. A budget without reforms will only allow Illinois’ debt to continue to spiral, putting investors – and more importantly, Illinois residents – at risk. Instead, Illinois politicians should pass major spending, economic, and pension reforms. It might just earn Illinois an upgrade.